MIMO or Multiple-Input Multiple-Output can be referred to as the communication channel created with multiple transmitters and receivers of an antenna to improve communication’s performance. Since their initial development in the year 1990, MIMO Wireless Communications have become integral part of the most forthcoming commercial and next generation wireless data communication systems. MIMO is one among the several types of Smart Antenna Technologies. Nowadays MIMO techniques are used in different technologies such as WI-FI and LTE (long term evolution). MIMO achieves space measurements to improve wireless systems’ capacity, range and reliability. It offers increase in the data throughput and link range without any additional bandwidth or transmitting power. MIMO antenna technology achieves this objective by spreading the same total transmit power over the antennas to accomplish an array gain that recovers the spectral efficiency (more bits per second per Hertz of bandwidth) or to achieve a diversity gain that increases the link reliability (reduced fading). MIMO technology makes advantage of a natural radio wave phenomenon called multipath. 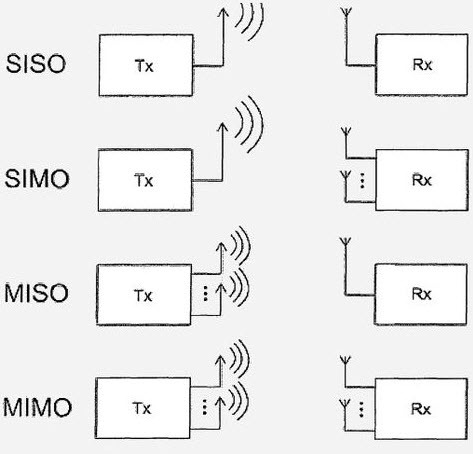 MIMO uses multiple antennas to transfer multiple parallel data signals from a transmitter. In any urban areas, this multi path will bounce off trees, ceilings and other commercial buildings. The signals can reach their destination on their own at the receiver end in different directions. There are different multi-antenna types that require different number of antennas, and also different levels of complexity. These types can be balanced to provide optimum solution for any kind of application. SISO: It is also named as Single-Input Single-Output which means that the transmitter and receiver of the radio system have only one antenna. SISO is a simple single variable control system which is less complex than the MIMO systems. This system doesn’t require any additional processing or diversity. Switched Diversity SIMO: This switched diversity SIMO looks for the strongest signal and switches to that antenna compared to the weakest antenna. Maximum Ratio Combining SIMO: This type of system takes both signals from the antenna and sums them to give a combination. The signals from both the antennas contribute to the overall signal. MISO: The MISO or Multiple-Inputs Single-Output is also termed as transmit diversity. This transmitter has multiple antennas, and the receiver has only one antenna. The advantage with this system is that it has multiple antennas and the redundancy coding is moved from the receiver to the transmitter. It also creates a positive impact based on the size, price and life of the battery. 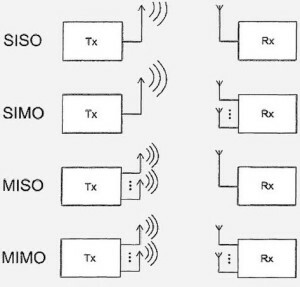 MIMO: MIMO is also termed as Multiple-Inputs Multiple-Outputs. MIMO is also used to provide improvement in both channel robustness and as well as channel throughput. MIMO means both transmitter and receiver have multiple antennas. Single-User MIMO (SU-MIMO): Single-user MIMO can be defined as increase in the data rate for a single user equipment (UE). Multi-User MIMO (MU-MIMO): If the industrial streams are allocated to numerous users, this is known as multi-user MIMO. This MIMO mode is mostly useful in the uplink based on the complexity placed on the user equipment side, and it can be kept to a minimum range by using only one antenna. This MIMO is also known as Collaborative MIMO. By using this Open-Loop MIMO, the communications’ channel does not use explicit information towards the propagation channel. The common Open-Loop MIMO systems consist of Space Time Transmit Diversity (STTD), Spatial Multiplexing (SM) and Collaborative Uplink MIMO. Space Time Transmit Diversity (STTD) is a technique of transmit diversity used in UMTSS third-generation cellular systems. Space Time Transmit Diversity is optional in the UTRANN air interface, but compulsory for user equipment. STTD utilizes Space Time Block Code (STBC) to abuse redundancy in multiple transmitted forms of a signal. The same data is coded and transmitted through various antennas that efficiently double the power in the channel. This improves Signal Noise Ratio (SNR) for the cell-edge performance. Spatial multiplexing is a transmission method used in MIMO wireless communications to transmit encoded data signals independently and separately (so-called streams) from each of the multiple transmit antennas. Therefore, the space dimension is used again, or multiplexed, more than one time. SM Delivers parallel streams of data to CPE by using a multi-path. It can double (2 x 2 MIMO) or quadruple (4 x 4) capacity and throughput. Spatial Multiplexing gives higher capacity if RF conditions are favorable and users are closer to the BTS. Collaborative MIMO is compared with the regular spatial multiplexing, wherein data streams are transmitted multiplying from multiple antennas on the same device. Collaborative MIMO is an additional open-loop MIMO technique considered by the WiMAX vendors to surge the spectral efficiency and capacity of the uplink communications path. An applied realization of this technique would be allowed for two separate end-users ‘WiMAX’ devices – each with a single transmit lineup, to apply the same frequency allocation to interconnect with the dual-antenna WiMAX base station. With these methods, two devices having only transmitted antenna can collaboratively transmit on the same sub-channel which can grow up the uplink capacity. MIMO antenna technologies are the key to increase the network capacity. It has started with the sectorized antennas. These antennas operate as one cell and illuminate about 60 to 120 degrees. In GSM, the capacity can be tripled, by antennas at an angle of 120 degrees. Adaptive antenna arrays intensify spatial multiplexing using narrow beams. Smart antenna belongs to adaptive antenna arrays, but differs in their estimation of smart direction of arrival. Smart antennas can also form a user-specific beam. Optionally smart antennas can also reduce the complexity of the array system. Beam forming is a technique used to form the radiation pattern of an antenna array. It can be applied in antenna array systems or for any MIMO systems. Phased array systems (switched beam forming) are defined as an array system with finite number of fixed predefined patterns. Adaptive Array Systems (AAS) (Adaptive Beam Forming) are defined as an array system with infinite number of patterns adjusted to the scenario in real time. The complexity and costs of these array systems are high compared to the Phase Array Systems. Precoding is a multi-stream beam forming – the narrowest form of a definition. In general, it is can be termed as the spatial processing that happens at the transmitter. In beam forming, the emitted signals from the transmitting antennas with an appropriate phase and gain weighting such that the signal power gets maximized at the receiver input. The assistance of this beam forming is to increase the gain of received signals, by making the emitted signals from different antennas to add up positively, and to decrease the multipath fading effect. When the receiver has multiple antennas, the transmitted beam forming cannot maximize the signal level of the receiver antennas simultaneously, and the precoded multiple streams are used. Spatial multiplexing needs MIMO antenna configuration. In spatial multiplexing, a signal placed at high rate splits into lower rate streams in multiples and each stream is transferred from different transmitting antennas in a similar frequency channel. If this transmitted signal reaches the receiver antenna array with different spatial signatures, the receiver can discrete these streams parallel into channels. Spatial multiplexing is a very influential method used for increasing channel capacity at higher signal-to-noise ratios (SNR). The maximum number of spatial streams is limited by the lesser number of antennas placed at both the transmitter and receiver ends. This multiplexing technique can be used with or without any transmitting knowledge of the channel. Spatial multiplexing can also be used for transmission of data to multiple receivers simultaneously; this method is also known as Space Division Multiple Accessing. Diversity coding technique is used to increase the link reliability in the occurrence of fading conditions. With this technique, same data can be encoded in multiple versions and that encoded data can be transmitted over multiple antennas. The encoding adds sometimes diversity level. The multiple signals that are propagated by using different paths are affected differently with fading process. The receiver then improves the original stream either by selecting the received signal or by merging all the information received. WiMAXTM prospects a peak data rate of about 74 Mbps at a specified bandwidth of about 20 MHz, and three Modulation types are QPSK, 16QAM, and 64QAM. The WiMAXTM 802.16e-2005 standard requires MIMO in Wireless MAN-OFDMA mode. This standard describes about a large number of different matrices for coding and distribution to antennas. In this principle, three or four transmitted antennas are possible. All these modes and matrices A, B, and C are available. In the figure shown below, the STC encoder block, streams are multiplied by the selected matrix and mapped into the selected antennas. In this Uplink-MIMO, only different types of pilot patterns are used. Coding and mapping is in the same manner as in case of non-MIMO. In case of this single user MIMO (SU-MIMO), two different users can use the same channel, such as collaborative MIMO and MU-MIMO. This network is defined by the 802.11n standard which undertakes a peak data rate up to 600 Mbps at a bandwidth of 40 MHz. Modulation types are of four types: BPSK, QPSK, 16QAM, and 64QAM. It has a backward, which is well-matched with the previous standards 802.11 a/b/g. With these four streams, it supports up to a maximum of three or four antennas. Wireless LAN differs between spatial streams (SS) and space-time streams (STS). If NSS < NSTS, then a space-time-block encoder (“STBC”) distributes the data from the Spatial Streams to the Space Time Streams and adds the transmitted diversity by means of coding. This article explains about the major categories of MIMO systems and their applications used in wireless communications network. MIMO wireless explains about the space dimension to improve range, system capacity and reliability. It offers significant changes in data throughput and link range without additional bandwidth or increased transmit power. Furthermore, for any information or help regarding this article, comment in the comment section given below.